Just when we thought BlackBerry was down and out, they have surfaced again. I know most of you have vowed to never touch a BlackBerry phone again, but have a look at the Curve, will this bring you back to owning a BlackBerry phone again? The company has today announced the most affordable BlackBerry smartphone on T-Mobile’s nationwide network – the BlackBerry Curve 9315. Powered by the BlackBerry 7.1 operating system with 3G connectivity, the sleek new smartphone is easy-to-use and provides tools that enable customers to stay connected to the people and information that matter most. 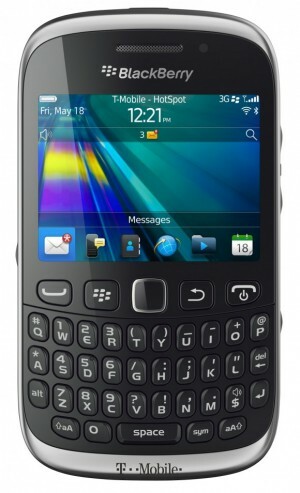 Combining an intuitive interface with a QWERTY keyboard, the BlackBerry Curve 9315 features built-in Wi-Fi connectivity for voice and data, enabling customers to access the information they need when and where they need it, and Wi-Fi calling, allowing calls and messages over an available Wi-Fi network. With a dedicated BlackBerry Messenger (BBM) key, preloaded apps for Facebook and Twitter and the Social Feeds 2.0 app, customers can easily interact with their friends, coworkers and social networks whether it’s instant messaging, posting or tweeting. The BlackBerry Curve 9315 will be available in an exclusive pre-sale for T-Mobile business customers beginning January 16 and is expected to be available in T-Mobile retail stores, via www.T-Mobile.com, and with select dealers and national retailers beginning January 23, 2013. For well-qualified customers, the Curve 9315 will require a $49.99 out-of-pocket down payment and 20 equal monthly payments of $10 per month via T-Mobile’s Equipment Installment Plan (EIP), with a two-year service agreement and qualifying T-Mobile Value voice and data plan. Customers may also purchase the Curve 9315 for $49.99 after a $50 mail-in rebate card, with a two-year service agreement and qualifying T-Mobile Classic voice and data plan.